If you have a mango allergy you may be wondering why such a delicious fruit would cause you such pain. Well, the answer is simple really. The mango belongs to the same family as many poisons such as poison oak, ivy and sumac. Many people actually suffer from this type of allergy but they may not find out about it until they have already taken a bite of the mango. When people who are allergic to mangoes eat one, they are most likely going to develop a rash around their lips and mouth area. This area is also going to get red and swell. They may notice that the area itches as well and it will eventually begin to flake. If you experience these symptoms while eating a mango, or shortly after, you may have a mango allergy. You should contact your doctor in order to be examined. If you really are allergic to this fruit you are going to want to know how you can avoid this reaction in the future. It may be possible to avoid developing these symptoms if you wash the fruit with soap and water before you handle it. You may want to carry it to the sink with a paper towel or a dish rag until you have had the opportunity to clean it. You are going to want to avoid letting it touch your skin. If you are not able to be near the fruit without breaking out then you are going to want to avoid them at all costs. Your doctor may be able to discuss possible ways to enjoy the fruit without causing an allergic reaction because the problem is located in the skin. It is difficult to stay away from the foods that we love when we have an allergic reaction to them. It becomes disappointing to know that we can not enjoy something we truly love. A mango allergy may be the same way. However, you may be able to treat the allergy with steroids. This may even make it possible for you to eat them if someone has already removed the skin properly for you. Never just assume that a medication is going to keep you safe. Always talk to your doctor before you do anything. If you have consumed several new foods in one evening before you broke out you may want to make an appointment with an allergist. Try to remember what you ate the day that you broke out. 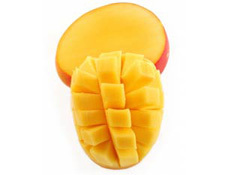 You will need to think about everything because a mango allergy may take a few hours to develop. Once your allergist has an idea of what you consumed, he or she is going to be able to run different tests to determine what exactly triggered the reaction. It may not have been the mango in the first place. You are going to want to know that so you can eat them again. You are also going to want to know the real source of the allergy so that you can avoid it in the future. Food allergies can be difficult because numerous foods can cause an allergy. When the allergy is in full swing you can be miserable. Most people will go to great lengths to avoid the food all together. You will want to talk to your allergist or doctor about what is best for you. Find out if you can eat foods that have mango juice in them. This may be ok for you as long as you are not touching the fruit itself. It is always better to be safe and fully understand your allergy. This helps keep you healthy in the long run.